Today, you have the opposition sitting across the table from the Syrian government. A few months ago that wasn’t going to happen. We have different political circumstances that exist now, former Pentagon official Michael Maloof told RT. 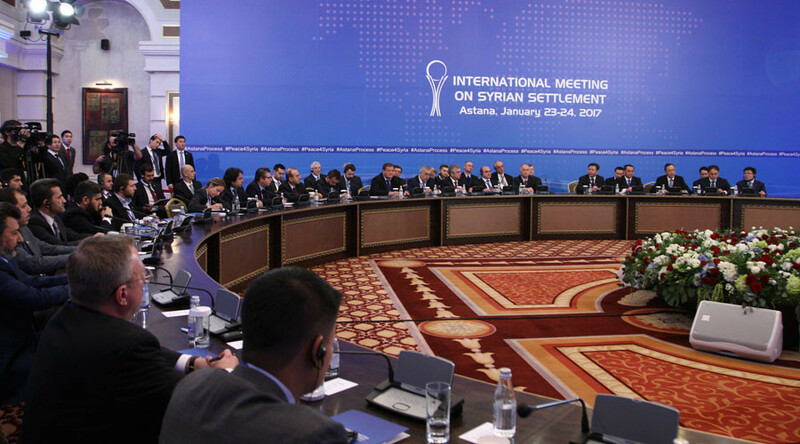 The peace talks between the Syrian government and opposition, led by Russia, Turkey, and Iran, continue in the Kazakh capital, Astana. RT: So many parties that couldn't have been imagined together at the same table even recently are now negotiating with armed opposition groups, Iran and Turkey. How much of a breakthrough is this? Michael Maloof: It is monumental. First of all, you have the opposition sitting right across the table from the Syrian government. A few months ago that wasn’t going to happen. I think we have different political circumstances that exist now. Different events have occurred now that are allowing this type of activity to coalesce. Part of it has to do with the leadership of Moscow in getting both the Iranians and the Turks, and the Turks make a major contribution here together, and even inviting the US to sit in, whereas that wasn’t happening earlier. RT: What do you make of the fact that for the first time the opposition delegation includes actual commanders from the militant groups, as opposed to political representatives? MM: That is important because they have control over the areas and the fighters over which they control those areas. That is an important element. You wouldn’t have had this six months ago. You only have the political types. Even then not all the opposition elements are represented, but the main ones are there. The fact that they are sitting down and talking is important. I think that at least with the opposition members, as long as they adhere to what the Turks want, to be able to move that agenda along and bring these elements together. Even [Recep] Erdogan, the Turkish President has said Assad does not need to go first before we sit down and talk. What they try to establish right now is at least a lasting ceasefire so that they can begin the political process under the 2012 Geneva Communiqué. This is an extension of the Geneva Talks, as far as I am concerned. It really represents a major breakthrough that we wouldn’t have seen six months ago. RT: Do you expect the US to join the negotiations, later on? MM: I think it has been a combination of diplomacy and military action – the so-called ‘hybrid approach to foreign policy’. Also the US now has different representation, and the opposition realizes they are not going to be getting the backing that they once had from the Obama administration. They also saw what occurred in Aleppo – that was important. That was probably the beginning of the end for the jihadi Salafist elements there. Of course ISIS, Al-Nusra, and [Jabhat] Fateh al-Sham remain targets, but they are not even party to this discussion in Astana. The reality is that these opposition groups now see that we’ve got to come together, we’ve got to talk and try to resolve this once and for all – the military option has not worked. RT: So many parties that couldn't have been imagined together at the same table even recently are now negotiating, the Syrian government and armed opposition groups, Iran and Turkey. How much of a breakthrough is this? Joshua Landis: Yes, I think it is important change. The biggest change, in my opinion, is that Turkey is now working with Russia. This indicates that Turkey is sending a clear sign to the rebels that Turkey can no longer back them up; that they are not going to get that kind of military help they have got in the past, and that they need to think about their future in terms of three possibilities. One, is agreeing to the amnesties that Assad is offering them; two, they can fight to the end like ISIS is doing, or three, try to flee into Turkey. RT: For the first time the opposition delegation includes actual field commanders from the militant groups, as opposed to political representatives. Do you expect much of a change here? JL: These talks are not going to change very much. The rebels have gone to Astana saying that this is only about prolonging the ceasefire. They claim the real political negotiations are going to begin in Geneva. They are saying this because in the last three Geneva Talks the West has said that for a political solution Assad has to step aside. The rebels are praying that somehow the West is going to stick to this demand and that it will help them in their struggle against Assad… So the choice for the most radical groups in Syria is ‘fight or flee.’ But the others have the choice of working out an agreement with Assad, through each militia, one at a time. RT: We're now hearing some of the opposition groups who confirmed their participation in the talks haven't arrived in Astana. Why do you think they're refusing to participate at the last moment? JL: We’ve seen this as a standard procedure. The rebel groups don’t believe that they are going to get many concessions from Assad. They want to go along because Turkey has insisted they go along. And they are totally dependent on Turkey for arms and passage, open traffic for their support through Turkish borders. So they need to do what Turkey asks, but at the same time, they don’t want to. They don’t want to be seen to be conceding to the Assad regime because this creates turmoil within their own ranks. Many people are bitterly opposed to attending the talks.